The purpose of the reverse osmosis booster pump is to increase water pressure going into the RO unit. The booster pump should not be confused with a delivery pump, also called a “demand pump,” that is used to increased the pressure of water leaving the RO unit. The two pumps are not interchangeable. They work differently and serve different purposes. 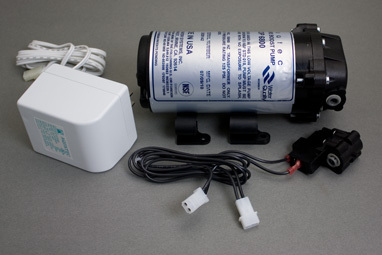 The picture above shows the three essential elements of the RO booster pump. The white object at left is the transformer. It plugs into a standard wall outlet and converts to the voltage (most commonly 24 volts) required by the pump. The large object is the pump itself. The third device is the pressure switch. It monitors the water pressure in the RO unit’s storage tank and turns the pump off and on in response to storage tank pressure. The most common shutoff pressure for undersink home RO units is 40 psi. Reverse osmosis is a pressure-driven process. Small residential RO units will theoretically operate on very low pressure–down to 35 psi, according to some membrane makers–but the reality is, you won’t get a lot of water and the product water quality will be compromised if the unit runs below 45 psi. Low inlet pressure makes the unit put out more reject water, produce less drinking water, fill the storage tank more slowly, and produce lower quality water. Do You Need a Booster Pump? Most city water reverse osmosis users have enough city water pressure to run their RO unit nicely and they do not need a booster pump. For example, if your city water pressure is 60 psi or more, there is little to be gained by adding a booster pump. If your pressure is 50 psi or less, however, a pressure boost pump will give your RO unit more zip. You’ll have more water, at a higher pressure, in the storage tank, and the tank will fill faster. The increased pressure will also improve the economy of the unit (it will run less reject water to drain) as well as the quality of the water. RO units thrive on pressure. Are All Pumps the Same? Manufacturers often designate pumps by the gallon-per-day output of the RO unit. With the Aquatec 6800 pump pictured above, the recommendation is for use with units with membranes that put out up to 50 gallons per day. For larger membranes, another model, the Aquatec 8800, is recommended. The standard pump setup is shown above. The function of the pressure switch in the tank line is to shut off current to the pump when the tank pressure reaches a preset level. Default pressure settings usually provide around 80 psi pressure going into the RO unit and shut off production when tank pressure reaches 40 psi. These settings can be adjusted, but it’s usually best to leave them at factory setting. 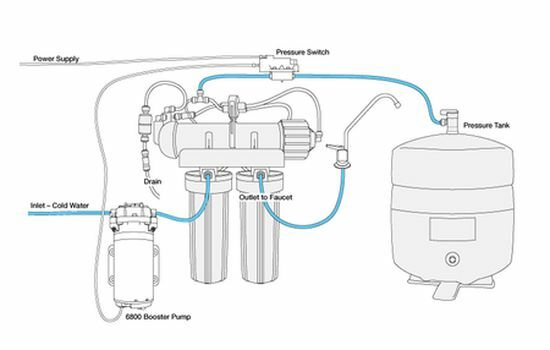 More Information about booster pumps.